Oddly, I managed to acquire a pack of crushed, store-bought graham crackers. Broken crackers don't make very good s'mores, but are perfect for making homemade graham cracker crust. If you're looking for a regular pie crust, check out the section on Pie Crusts from my post on chicken pot pie. For any sort of sweet pie, instead of using a flaky pie dough made of butter and flour, you can make a graham cracker crust. Unlike the slightly stale, overly sweet, store-bought version, homemade graham cracker crust is buttery, crumbly, lightly sweet and flavorful. Making your own crust is a simple, easy way to make your pies lots more impressive and delicious. Homemade graham cracker crust would be perfect for fruit pies, custard, no bake desserts, cheesecakes, and more. Add all of the ingredients to a blender or food processor. Blend until the mixture is thick, coarse, and sandy. Press the mixture into the bottom and up the sides of a 9-10 inch pie pan. For a baked dessert, bake at 350 degrees for 10-12 minutes. For a no-bake dessert, chill the crust for 2 hours before using. 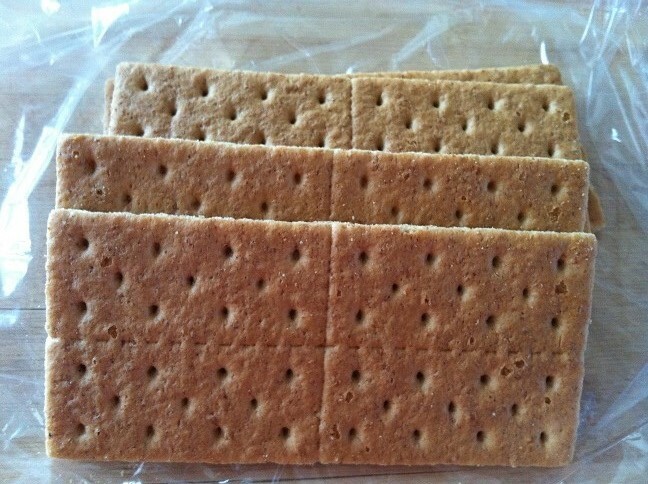 Graham crackers: Any sort of hard, dry cracker would work, such as saltines or vanilla wafers. One full sheet contains 4 crackers, so you will need about a sleeve of store-bought graham crackers. Alternatively, you can use half of a batch of homemade graham crackers. Butter: Binds together the homemade graham cracker crust. Requires at least 3 tablespoons, and uses up to 6 tablespoons. For a vegan option, substitute vegan butter or mild-flavored oils (canola, coconut). For a low fat option, substitute yogurt or milk, and squish together the crust more tightly. Sugar: Adds sweetness. Use up to 1/3 cup. Instead of white sugar, you can add brown sugar for additional flavor or powdered sugar for a more consistent texture. Additional flavoring: Add up to 1/4 teaspoon of salt to enhance the other flavors. Add up to 1 teaspoon of vanilla. Add up to 1/2 teaspoon of cinnamon. Homemade graham cracker crust is best made in advance. You can bake or chill the crust to firm it up. Chilling the crust in the fridge takes longer (2 hours), but requires no oven. If you're baking the pie crust, preheat the oven. You can pre-bake the crust at temperatures from 325 to 425 degrees for 7-12 minutes. I baked the crust at 350 degrees for 10 minutes. Here are the graham crackers I used for homemade graham cracker crust. A sleeve (1 individually wrapped package) of graham crackers contains 9 full sheets, and I had a few crackers leftover from another sleeve. Measure 5 tablespoons of butter into a small bowl, and microwave for 30-45 seconds to melt. Add all of the ingredients into a food processor or blender. If you don't have a food processor or blender, you can crush the graham crackers in a plastic bag, but this method takes longer. Don't forget to zip up the plastic bag to prevent a graham cracker mess. Blend until the mixture is thick, coarse, and sandy. There should be no large pieces of graham crackers leftover because they make the crust less cohesive. Press the mixture into the bottom and up the sides of a 9-10 inch pan. You can use your fingers or the bottom of a measuring cup to press down the pie crust. If the mixture does not pack well, add more melted butter or water, a tablespoon at a time. For a baked dessert, bake for around 10 minutes. For a no-bake dessert, you can bake the pie crust and cool to room temperature, or chill the crust for 2 hours before using. If you start making the pie filling after you take the crust out of the oven, the homemade graham cracker crust will have plenty of time to cool. Here is the homemade graham cracker crust after baking. Baking the homemade graham cracker crust toasts the graham crackers, firms up the crust, and prevents it from being soggy even when holding liquidy fillings.